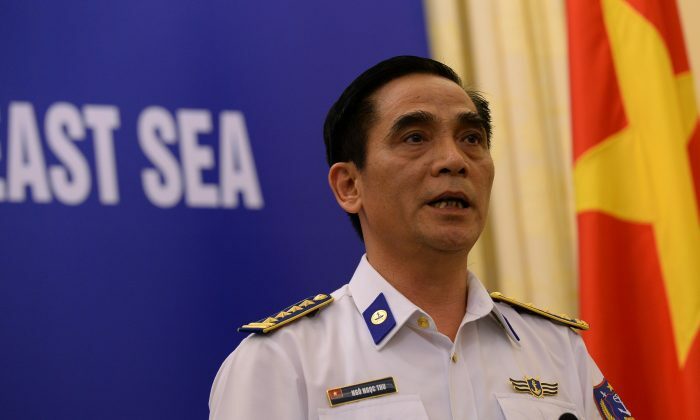 On Wednesday the Chinese regime removed its oil rig on from territorial waters claimed by Vietnam. The rig is now headed to waters near China’s Hainan Island, but the tensions and diplomatic harm it created for China will not soon disappear. The official line of Chinese authorities is that the rig finished its work and typhoon season was coming, so it was removed. The deployment of the rig in early May was made more provocative by a fleet of 80 vessels, including 7 warships that accompanied it. The rig became the focal point of a naval standoff between China and Vietnam, with Chinese ships ramming Vietnamese ships, and both countries accusing the other of hostilities. By positioning the rig in waters claimed by Vietnam near the Paracel Islands, the Chinese regime was placing a claim on those waters—one of several recent provocative actions meant to assert a Chinese claim to disputed territory. On Nov. 23, 2013, the Chinese Defense Ministry unilaterally announced an Air Defense Identification Zone (ADIZ) over international waters in the East China Sea. It threatened “emergency military measures” against anyone who didn’t follow China’s new rules. Just over a week later, China sent its aircraft carrier, two missile frigates, and two missile destroyers to an area of water between Hainan and the Paracel Islands. The ships then claimed an “inner defense layer” that covered 2,800 square miles and blocked off most of the channel. China soon followed its East China Sea ADIZ with “no fishing” zones in the South China Sea. It has since used those zones as a legal pretext for harassing ships from other nations in the area. In the wake of China’s growing aggression, an alliance has formed among China’s neighbors, and their diplomatic scales have tipped in favor of the United States. As part of the Asia Pivot, the U.S. Navy has shifted forces to the Asia–Pacific region, while the United States has been reaffirming its commitment to countries in the region—including South Korea, Japan, the Philippines, Malaysia, and Vietnam. The resolution builds the case over several pages that China’s claims violate international law. The Chinese regime claims Spratley Islands, Paracel Islands, and Senkaku Islands and stretch deep into the South China Sea, toward the lower tip of Vietnam. Its claims also include areas within the exclusive economic zones of several other countries. The Chinese regime claims historical ownership of the waters, and has used ancient maps as an attempt to justify its actions. Other nations, including Vietnam and the Philippines, have shown similar maps stating otherwise. Rumors that a former top Party official, Jia Qinglin, has been detained were widely spread before being shut down by authorities. Over one hundred flights between Beijing and Shanghai were canceled in the afternoon of July 14.